The 2013 Subaru BRZ GT300 race car has completed a shakedown in preparation for the SUPER GT series and has identified the weak points from last year. Subaru will again compete in the 2013 season of the SUPER GT series which is widely regarded as Japan's top motorsports category. The team has just recently completed official tests and a fan event that took place earlier this month at the Okayama International Circuit in Japan. They have begun testing the 2013 Subaru BRZ GT300 race car that was built by STI under the supervision of Hideharu Tatsumi, General Manager of STI Motorsport Project Office in Japan. A large number of spectators enjoyed the BRZ GT300 in action as the team has begun testing the tires and chassis on the race car. The Subaru BRZ race car is operated in conjunction with "R&D SPORT" led by Director Shinji Motojima, and Tetsuya Yamano and Kouta Sasaki will be driving for the team. The 2013 BRZ GT300 uses the same front-engine, rear-wheel-drive layout as the production 2013 Subaru BRZ model that is so popular around the globe. But what did the team learn from last years race series? Based on the production model, the BRZ GT300 is built for racing that has been developed in accordance with JAF GT regulations. The race car makes the most of Subaru’s horizontally opposed Boxer engine and characteristically low center of gravity. The car features superior handling performance and will be competing against FIA GT3 cars of foreign marques, and will utilize its excellent cornering speeds to compete in the 2013 race series. But the tires and chassis tuning were identified last year as weak points. Before the season begins, the BRZ GT300 team puts the car through severe tests on the Okayama International Circuit and completed the first runs and testing of the tires. During the tire test in the previous week, the newly built car suffered some “teething trouble.” This means the team was having trouble confirming the exact performance of the GT300. But the team brought the car back to the garage and were able to correct the problems. The SUPER GT test is actually the first official event of this year's series, and it gives fans a first glimpse of the race cars. On the first morning, the Subaru team was able to confirm the performance of the newly adopted Michelin tires that are new to the car. The car finished the test with flying colors and returned to the garage in perfect condition. After the first round of tires tests, the team then moved on to chassis setting data collection in the afternoon. The second day of testing saw the team conducting long distance tests with actual race operations in mind to prepare for the season opener on this circuit. They checked the degree of wear relative to the number of laps run with the new Michelin tires, as well as the impact of tire wear along with fuel consumption. Each race team gets 2 hours each in the morning and afternoon to gather all their test data. 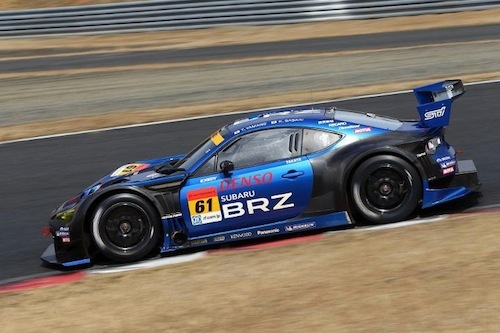 The 2013 Subaru BRZ GT300 race team will try to build on last year’s success. Tatsumi knows the last races of the season clarified both the progress that the BRZ made, and helped them identify the remaining weaknesses. The team identified the tires and chassis as areas that needed work and are off to a good start for 2013.